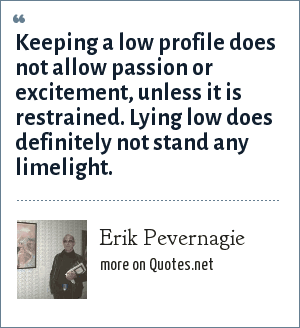 Erik Pevernagie: Keeping a low profile does not allow passion or excitement, unless it is restrained. Lying low does definitely not stand any limelight. "Erik Pevernagie Quotes." Quotes.net. STANDS4 LLC, 2019. Web. 18 Apr. 2019. <https://www.quotes.net/quote/63167>.